Lawrence of Berkley and I decided to head out to Algonac this morning in hopes of catching from ice breaking action. We arrived to see all four of the ice breakers (two U.S. and two Canadian Coast Guard ships) doing their thing in the channels. 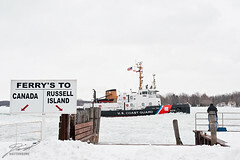 We ended up watching the U.S. Coast Guard Ice Breaking Tug 107 (Penobscot Bay) for quite some time as it cleared the North Channel around Russel Island.